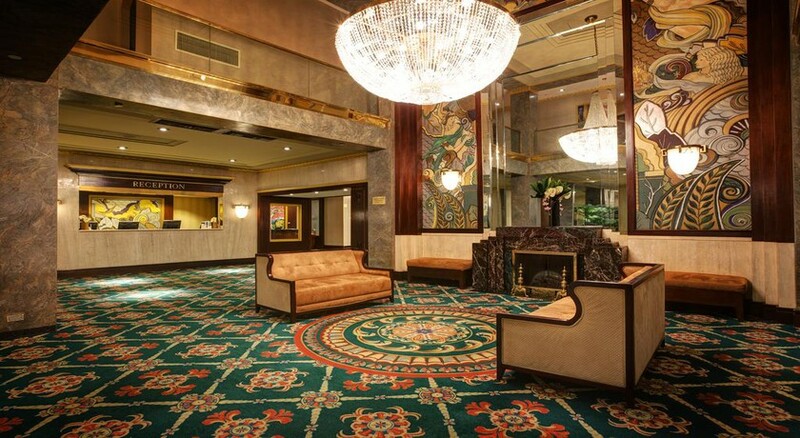 The Wellington Hotel is a 114-year-old institution, which is synonymous with luxury and elegance. Strategically located between Times Square and the Central Park, Wellington is a darling of the city’s hospitality scene. The property is surrounded by some of the best shops of the Columbus Circle and top-notch restaurants of the city. Guests can dig into some scrumptious Greek delicacies served in the on-site restaurant of the hotel. You get Wi-Fi throughout the hotel’s premises and the transportation desk of the hotel takes care of the local sightseeing and excursions. The hotel rooms are extremely modern in appearance and feature en-suite bathrooms with private bath amenities. All the rooms are equipped with high-speed Wi-Fi, clock radio, work area, iron, ironing board, flat-screen TV with on-demand movies. 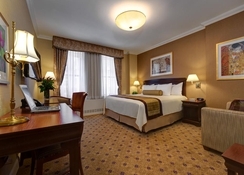 The Wellington Hotel is strategically located near the iconic Times Square, the Central Park and the Carnegie Hall. 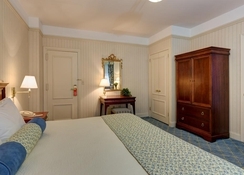 The hotel is a 2-minute walk from the Central Park. You need to drive half a mile to reach the Times Square. The Broadway, New York’s theatre district, is also situated close by. The closest airport to this century-old institution is La Guardia Airport, which is situated at a distance of 9.2 km. 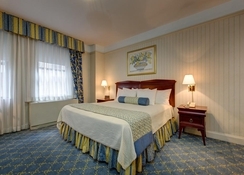 The accommodation choices of the hotel are far and wide: Standard Room with One Double Bed, Queen Room, Standard Double-Double Room, Deluxe King Room, Deluxe Double-Double Room and Deluxe One-Bedroom Suite. With a maximum occupancy of two, you get to live in luxury and comfort, while taking care of your business. 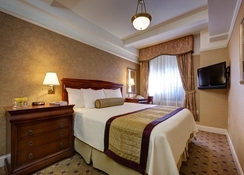 Each of these rooms is well equipped with modern amenities. Each room has a private bathroom hair dryer, iron, ironing board, well-lit work area, flat screen TV, and high-speed wireless. Molyvos, the onsite restaurant at the Wellington Hotel is among the most authentic Greek restaurants in New York. The restaurant is located in the lobby and serves traditional Greek dishes from Monday to Friday. Do not forget to try grilled fish. On weekends, the restaurant serves brunch at 11 am. Dinner is served between 5 pm to 11 pm. The neighbourhood of the Wellington is always buzzing with activities. There is always something to do or explore in the neighbourhood. Visit the iconic Empire State Building the Broadway Theatre or the Central Park or take a daytrip to check out the places near New York. 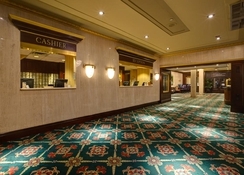 The hotel also provides the perfect setting for organizing corporate events and social gatherings. Construction is going on to the next building which is visible to guests. Great hotel and service, exactly what we needed for our short stay in NY. Great location too!